Recent research breakthroughs at Los Alamos National Laboratory are helping to deliver on the promise of truly “cheap solar,” with several surprising side benefits. Hot-cast perovskite solar cells show promise for creating more efficient and affordable solar panels, LEDs, and lasers. Image courtesy Los Alamos National Laboratory. Although the goal of cheap, plentiful energy from the sun turns out to be a work in progress, not a settled achievement, recent research breakthroughs at Los Alamos National Laboratory are helping to deliver on the promise of truly “cheap solar,” with several surprising side benefits. The solar photovoltaic (PV) panels that are becoming more and more common on neighborhood rooftops rely on silicon semiconductors to capture the sun’s rays and, through the photoelectric effect, convert that light into electricity. Silicon has been the semiconductor of choice for PVs for 70 years. The technology is well understood and its 25 percent efficiency in converting sunlight to electricity has been good enough to create market-viable solar panels. But while PVs have come down in price recently, silicon solar cells have bumped up against a hardened cost/energy-efficiency constraint that continues to thwart progress toward a world powered largely by pollution-free solar-generated electricity. Sensing an opportunity for discovery science to provide a practical solution that could bolster the nation’s energy portfolio, Los Alamos formed the Light to Energy team in 2013. The team’s goal, which reinforces the energy security component of the Laboratory’s mission, is to develop clean energy by providing low-cost, commercially viable technologies. So this small group turned to an intriguing class of materials called perovskites that could enhance or replace silicon in solar cells. Perovskites, which are materials characterized by a particular crystalline structure, were discovered in 1839. In the 1970s, materials scientists synthesized organic (carbon-based) and inorganic compounds into hybrid perovskites that maintained the unique crystalline structure and behaved as a semiconductor, which is useful in a range of electronic applications. In 2009, a hybrid perovskite was first incorporated into a solar cell. Further work showed that the material, when formed in thin layers, held great promise for creating efficient, flexible, commercially viable solar cells—if only the team could work out a few glitches with the material’s stability under conditions of direct light, high temperature, and humidity. To fix those bugs, the Light to Energy Team started with basic lab-bench research into hybrid perovskites. An early breakthrough came when the team learned that so-called three-dimensional perovskites, which suffered decreasing energy when exposed to light—(granted, an ironic trait for a solar cell)—healed themselves after a short time in the dark. Another challenge involved solving a decades-old puzzle: how to control the crystalline orientation within a perovskite film just one atom thick—a so-called 2-dimensional layered perovskite. The team soon found that the actual method of making perovskites determined their properties. Using a hot spin-casting process, the team discovered it could create a perovskite film with very large-grained crystals oriented a particular way that increased the electrical conductivity. With this breakthrough, the Los Alamos team and their collaborators from Rice University and Northwestern University were able to induce electrons to flow freely downward through the material, solving a bottleneck that has hampered perovskite applications for 30 years. This increased the efficiency and stability of the new 2-D perovskite, surpassing the performance of their 3-D counterparts. 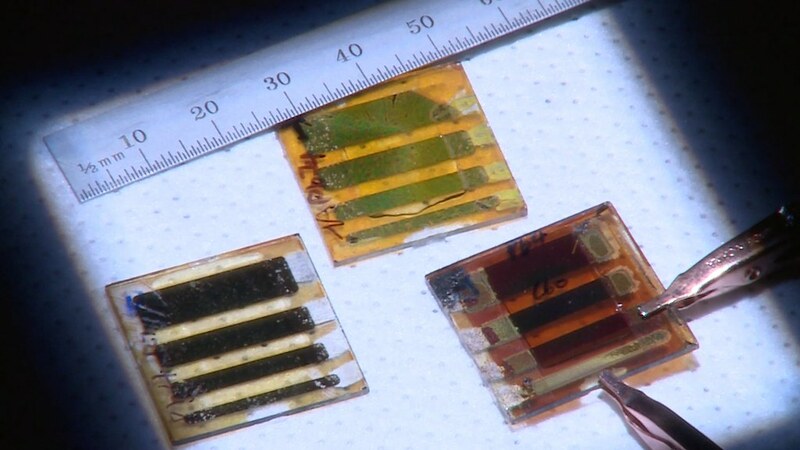 The team is confident they can bring the 2-D material to 15-percent to 20-percent efficiency, in the ballpark of silicon solar cells, at which point perovskites will be commercially viable. That might be five to seven years off, but the applications, perhaps in tandem with silicon semiconductors, are tantalizing. In addition to the potential for hybrid perovskites to bring down the cost of solar electricity, they also could be used to create more-efficient light-emitting diodes, or LEDs, lasers, photo-detectors, and particle detectors. Beyond working on perovskites, the Light to Energy team and other groups at Los Alamos are researching a variety of alternative energy approaches based on new materials, from quantum-dot solar windows to high-efficiency fuel cells that make electricity from hydrogen and oxygen while leaving only water behind. In the case of hybrid perovskite solar cells, the team has completed the basic discovery science. The remaining tasks involve refining the understanding of the materials and perfecting the processes to produce them, so they can be commercialized. Given the rapid advances in this science over just a few years and considering the buzz around perovskites in the solar energy research communities, this intriguing material stands poised to help solar energy realize its natural potential as a widespread clean energy source. Aditya Mohite, an electrical engineer with a background in solid-state physics, leads the Light to Energy team in the Materials Synthesis and Integrated Devices group at Los Alamos National Laboratory. The other team members are Gautam Gupta and Wanyie Nie. Together they conduct research into materials for converting sunlight into electricity and related processes. YouTube: Flipping Crystals Leads to Better Solar Products. In a step that could bring perovskite crystals closer to use in the burgeoning solar power industry, researchers from a joint Los Alamos National Laboratory, Northwestern University and Rice University research study have tweaked their crystal production method and developed a new type of 2-dimensional layered perovskite with outstanding stability and more than triple the material’s previous power conversion efficiency. YouTube: Los Alamos Discovers Super Efficient Solar Using Perovskite Crystals: Solar cells composed of a recently discovered organic-inorganic perovskite material offer the efficiency of silicon, yet suffer from a variety of deficiencies limiting the commercial viability of perovskite photovoltaic technology. Los Alamos National Laboratory researchers reveal a new solution-based hot-casting technique that eliminates these limitations.